Ring any bells, Jon Donnison? '....Over time, I came to realize that to be considered a successful journalist by the Western media, a journalist must stick to an acceptable script. In the Middle East, this means portraying Israel and the Jews as the bad guys, and the Palestinians and the PA as the good guys. If you don’t do this, you are professionally ostracized. Beyond this, however, I found that some stories carried with them an inherent dislike for the Jewish state and the Jewish people. I’m not speaking about most of the Western media. But a few conversations with journalists do come to mind in which it was obvious that the motivation for their stories was anti-Semitism. What’s scary is that these stories inevitably play a major role in shaping foreign policy toward Israel. I admit that, at times, I questioned my perception of the situation in Israel. Was I missing something? I felt like I must be doing something wrong, because my views didn’t fit into the framework presented by the Western media.... And the Western media’s view of Israel is a status quo that needs to be questioned. There is another reason why Western journalists must begin to question their biases and their conduct toward Israel: Their failure do so is pushing peace further away. For example, the Western media feeds the corruption of the Palestinian Authority. If journalists really want to help change things for the better, they should have the courage to criticize the Palestinians and their government. They should report on human rights violations committed by the PA (and Hamas). They should tell the world about incitement again Jews and Israelis in PA-controlled media, as well as mosques and schools. They should report on the television shows that teach Palestinian children to hate Jews. They should share the stories of Palestinians who want to speak out against their leaders, but are afraid to do so for fear of imprisonment or death. Give Palestinians a real voice. Putting all the blame on Israel will never change the fate of the Palestinian people. In fact, just like the PA, the Western media exploits the Palestinians. They use them in order to get the award-winning story their editors want. What the Palestinians do not realize is that these journalists don’t care about the Palestinians. They interview a few people in Ramallah about their struggles, take some emotional photos, and then head back to the comfort of the King David Hotel in Jerusalem. As a result, decades of pro-Palestinian bias has changed nothing. .... As a journalist myself, it pains me to see how bias, unprofessionalism, laziness, ego, and sometimes outright racism influences coverage of Israel and its conflict with the Palestinians. These failures are not only a violation of journalistic ethics, they make peace less likely and embolden Israel’s enemies, and the enemies of democracy around the world. Those are extracts from a suberb indictment of journalistic bias against Israel, entitled 'Yes, Journalists Choose Sides in a Conflict—and Often for the Worst Reasons' by Israel-based journalist Zenobia Davji, herself of Parsee heritage. The entire piece must be read. Thanks for highlighting her courageous article! The McNeill chick is up to her usual smearing Israel, hardly giving it a fair go. Jezza tries to sound profound with this silly out-of-context retweet and comment. 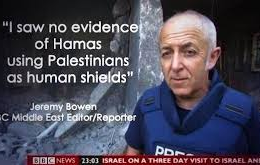 There is no reason why journalists can't be held to the same factual standards in and about Israel as anywhere else. If the the NYT's Jason Blair can be fired and publicly destroyed for making things up then why not these tools? Self policing doesn't work and media ombdudsmen are a joke. So create a review board and drag them before it if they want to retain their credentials. Because the moment they continue their job w/o credentials it makes them legitimate targets of the police and the army before during and after attacks. If the BBC wants to bury its people, that's on them.